I used to have an irrational disdain for DC superheroes as a child. I was a “Marvel kid.” Sure, I loved Batman, but outside of his adventures I turned up my nose at DC fare. The echoes of my own irrationality reverberated into the future as I stuck to reading The Amazing Spider-Man, Captain America, and then occasional X-Men book as an adult. But somewhere along the line, Marvel decided to adopt a business model that needlessly alienates long-term readers. That, my friends, is where our discussion on DC’s The Button comes in. Marvel Editor-in-chief Axel Alonso and everyone who takes their marching orders from him would be wise to look at what DC is doing under the watchful eyes of Geoff Johns. DC Rebirth was a creative home run, and now it seems as if the same can be said of The Button. Check out my latest YouTube review on parts 1-3 of The Button, which is a great blueprint for Marvel to follow if it wants to win back fans. And, as always, I’m interested in hearing your feedback in the comments section below. I am generally not fond of alternate-universe tales where heroes have become darker versions of their normal selves. 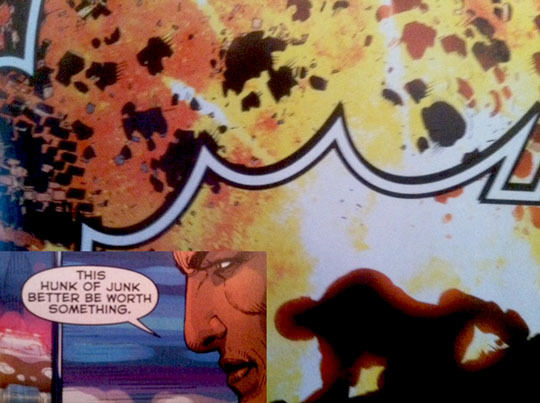 With Flashpoint, however, Johns enters territory that was superbly explored by Rian Johnson’s Looper in 2012. When my wife and I watched Looper she asked, “If I was murdered and you could go back in time to stop the person who did it, would you?” My answer: No. Flashpoint asks the same question, with Barry Allen having no clue that in an attempt to save his own mother’s life he inadvertently created a much darker world than he could have ever imagined. The challenge for Barry throughout the book is to a.) figure out how he woke up in this new world — where his mother is alive, Bruce Wayne died instead of his father, and Wonder Woman’s Amazons are at war with Aquaman’s Atlanteans — and b.) how to make it right. Where things get tricky for readers like me, who are somewhat indifferent towards Flash’s history, is judging a book where writers took liberties with his origin. A friend of mine told me that historically Allen became a cop just because he was a good guy — not because his mother was murdered by the Reverse Flash. While it is odd to imply heroes need to experience tragedy in order to prompt them to fight evil, in this case Johns inoculates himself from a lot of criticism by simply writing a good story. The final thing to note about Flashpoint is that its ending is amazing. There is an incredibly powerful scene with Bruce Wayne that makes the $17 price of the trade paper back worth every penny. The emotional impact of the moment can only be appreciated by reading the whole book — and for that Johns should be applauded. If you get a chance, then check out Flashpoint. It’s a product worth adding to your comic library. Two tattoos — but only one of these characters is a car thief. Hint: He’s near and dear to liberal writer Geoff Johns. 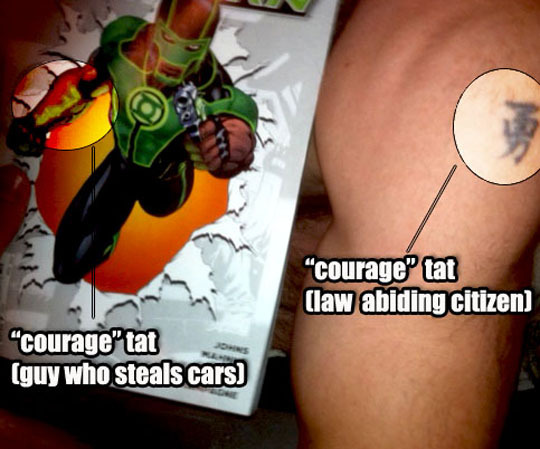 Geoff Johns’ new Green Lantern, Simon Baz, has something in common with me — we both have “courage” tattoos. The major difference between us? He’s a car thief, and I’m a law abiding citizen. I got mine while I was on leave with my Army buddies in Greece and everyone from my platoon decided it was time to get some ink. I hated all the options available, but I wasn’t about to deal with the jokes that would follow if I punked out. Simon Baz? His ink seems to stem from all the hardship he had to endure as a Muslim American, post 9/11. Sadness. The kind of sadness that propels a man to a life of crime. Unfortunately for Johns, the Libyan militias who murdered Ambassador Christopher Stevens, two former Navy SEALs and another American on September 11, 2012 had other plans. It turns out that the world is more complex than a Geoff Johns comic book after all. Who knew. 9/11 happens. 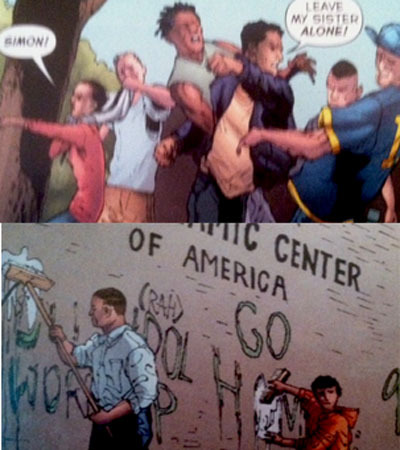 Simon Baz, from Dearborn Mich., is subsequently harassed for his heritage after the attacks. Somewhere along the way, Baz becomes an automotive engineer. He loses his job, and becomes a car thief. Baz steals a car that ends up having a huge bomb in it. He drives it to his old, abandoned factory during a police chase, and it explodes. 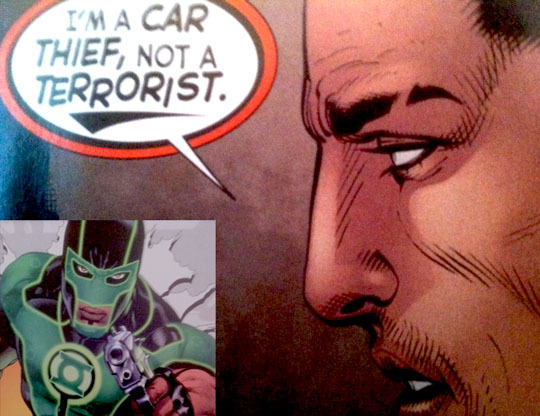 Personally, I don’t care that Simon Baz is Muslim. I really don’t. What I care about is that once again we have a liberal writer who feels the need to jam his politically-correct vision of the world down the reader’s throat. Note: Images below are not in the order they appear in the book. If it’s not obvious why, feel free to ask in the comments section. Look out! It’s post 9/11, and gangs of predominantly white anti-Islam bigots are roaming the streets looking to pick on a random girl wearing a hijab. Yawn. 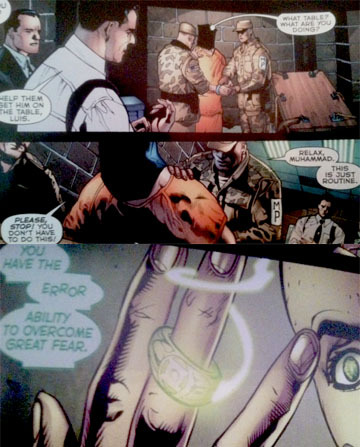 While I’m sure the “error” message Simon got from the ring will explain why a thief was chosen as a Green Lantern, it is rather interesting that out of all the good Muslims in the world … Geoff Johns chose a guy whose instinct is to resort to crime when he’s in a jam. 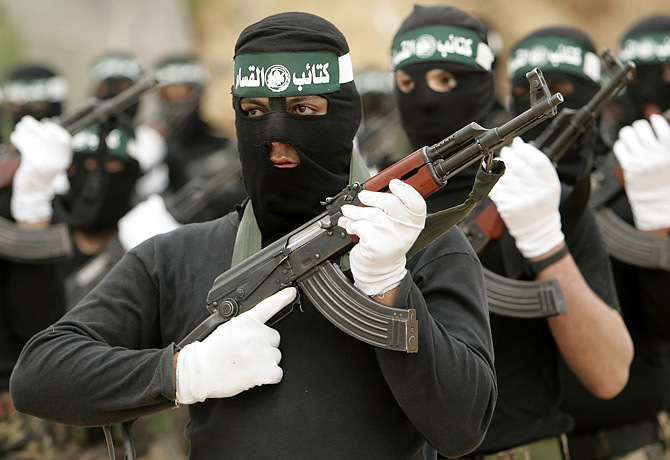 PS: His costume also looks like something that he pulled from a Hamas bargain bin. Might want to change that one, Mr. Johns. Hamas called. They want credit for the new Green Lantern costume or they’re taking you to court, Geoff Johns. Well, that or they might kill someone. Ah yes, no American comic featuring a Muslim would be complete if the creators didn’t make sure to let everyone know how dark and twisted America is at its soul. I heard that if you’re Muslim and you get caught jaywalking, you might wind up with a black bag over your head at an undisclosed location. Geoff Johns told me, so it’s probably true. Again, I really don’t give a rip that Simon Baz is Muslim. I don’t even care if he puts a force field around himself during battle to take time to pray to Mecca. Knock yourself out, Mr. Johns. But what I do care about is the lopsided debate that you’re injecting into the material. Sure, you’ll go to the Arab-American National Museum to do research, but I doubt anyone like Ayaan Hirsi Ali will ever be reached out to. Ever. So instead of getting a thought-provoking read about culture clashes and religion, we get yet another lecture from the sensitivity police. No thanks. I think I’ll save the disposable income. Now if you’ll excuse me, I think I’ll read Guy Delisle’s Pyongyang for the tenth time. Note: The Pyongyang review is here.